Ultimately the biggest and still the best Chinese Buffet Restaurant in Middlesbrough, set in comfortable, modern surroundings. 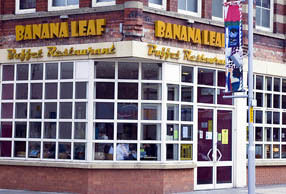 The Banana Leaf Buffet Restaurant was magnificently converted from the old Primitive Methodist Sunday School at the top of Linthorpe Road in the heart of Middlesbrough. Banana Leaf Buffet Restaurant is managed by a strong team of skilled and experienced staff who have aided in developing our chain of Buffet Restaurants around the UK. It's a Buffet restaurant in a frankly inferior interior with poor seating and dining areas that look very dated. I've never been a big fan of buffet restaurants because I hate the idea of food being on show all day long under heat lamps with anyone and everyone tucking in and this place in no exception! The dessert range is also very poor with cheap (think smart price or tesco value) ice cream and very little else. Not tempted to visit again to be honest. Oh - they also serve chicken nuggets and chips! !